Political debate is eternally fractious. In what has been a politically tumultuous period it has become an increasingly common assertion that we are witnessing a rapid deterioration in the decorum of public and political debate. Indeed, the characteristic tone of such political discussion is now seen as uncivil, divisive, insulting and even threatening, a development often thought to be linked to the growth of social media and the image of the angry, isolated ‘troll’ hammering away at their keyboard. The anonymity and physical distance provided by digital technology are seen to give rein to anger and rancour. It might be tempting to assume that politics was not the stuff of everyday conversation for anyone outside the political elite in this period, but historians have long since put this idea to bed and shown that political awareness and engagement was high across the social scale. The growth of political awareness and discussion in 17th-century England – what we now call ‘public opinion’ – has been associated with the rise of the coffeehouse from the 1650s onwards, a place where urbanites could go to read that emerging product, the newspaper, and to engage in caffeinated chatter over the state of the nation in a civilised and rational spirit. But long before the coffeehouse came onto the scene both town and country dwellers of all classes had used another site of liquid refreshment as a place to gather and debate politics: the pub. 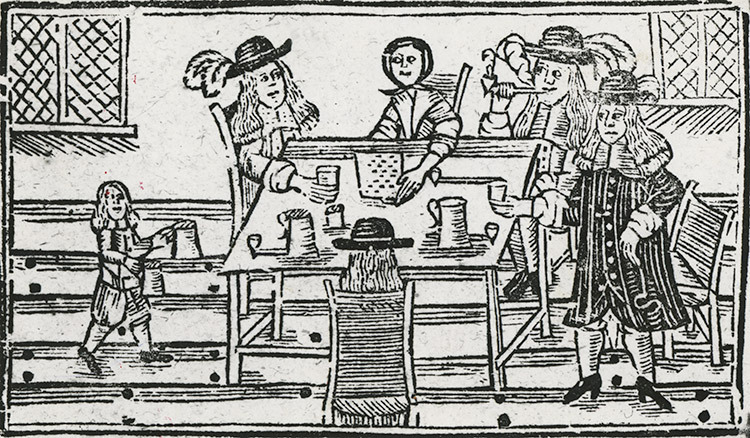 Commonly known as the alehouse, the local pub had enjoyed a period of growing popularity in the century between 1550 and 1650, with numbers more than doubling from around 25,000 to 55,000 – or one alehouse for every 90 inhabitants of England. Almost every village would have had at least one such establishment and part of its appeal was the opportunity to engage your neighbours in political debate. This was acknowledged by the authorities in both Church and State, who were always uneasy about the ‘lower orders’ developing their own political views. Charles I complained in the 1630s about the proliferation of the common peoples’ ‘idle and discontented speeches in their alehouses’ and the Bishop of Bath and Wells wrote to his king that on Sundays after evening prayer the people would go to ‘tippling houses, and there upon their ale-benches talk of matters of the church or state’. What was the tone of these discussions? They could be civil. The Lancashire apprentice shopkeeper Roger Lowe recorded in his diary in February of 1664 an alehouse conversation in which ‘John Pott and I began to discourse concerning the manner of God’s worship, he was for Episcopacy and I was for Presbytery. The contention had like to have been hot but the Lord prevented [it]’. In June of that year Lowe went to the alehouse with Thomas Jameson, where they ‘stayed late in night and we began controversy, he a papist began to speak revilingly of Luther and Calvin which I laboured to defend … we were in love and peace in our discourse’. As often as not, though, discourse about matters of Church and State were not so peaceful and civil, as court records about seditious words and breaches of the peace reveal. In Dartford in 1539 a baker proposed a toast to Henry VIII, saying: ‘God save King Henry, here is good ale’, only to be met with the response from a miller and a labourer, with whom he was drinking and who were critical of Henry’s religious policies: ‘God save the cup of good ale, for King Henry shall be hanged.’ The baker duly reported them to the local authorities for speaking ill of the monarch, a clear sign that there was no love lost. If they were found guilty of imagining the death of the king, the punishment under Henry’s new Treasons Act was execution. Such fallouts were common at the time of the civil wars during the following century. The atmosphere was clearly charged in the drinking establishments of Wells, in Somerset, in the wake of Charles I’s execution in 1649. Humphry Butler, a seller of ‘sweet powders’ to barbers, urged his fellow drinkers ‘several times to drink the King’s health’ and when ‘others would not pledge the same, quarrelled with them’. Butler was not the only one in Wells loyal to the executed king. During another alebench conversation that year, Robert Allen opined that ‘the king had a fair trial for his life’, only for Peter Sandford to retort that the king ‘was tried by a company of rogues’ and because Allen and others present had ‘spoke in the behalf of Parliament … he could find in his heart to throw the jug [of beer] in their face’. Another political disagreement that took a violent turn occurred in a village alehouse in North Bradley in Wiltshire, in 1685, when James II – the Catholic brother of Charles II – controversially took the throne. William Jennings, a metal worker, proposed a health to the new king, only for John Moore, a labourer, to declare that he would ‘drink no health to any popish rogue’, before striking Jennings a blow on the head with a stick ‘so that he lost much blood by it’. Countless other examples exist in the archives, showing that in alehouses across Tudor and Stuart England the common people huddled around the fire to debate politics and that civility and mutual understanding were then, too, in short supply. A difference of opinion was likely to descend into the trading of insults, blows, drinks thrown in the face – or even with being hauled before the authorities for a capital offence. The anonymity and physical distance provided by the computer screen are neither necessary nor sufficient for the development of bitter and fractious cultures of everyday political discussion to emerge in times of political turmoil. Mark Hailwood is a postdoctoral research fellow in history at the University of Exeter and the author of Alehouses and Good Fellowship in Early Modern England (Boydell & Brewer, 2014).